Eczema, also known as atopic dermatitis, is a common condition that usually develops in early childhood. Most of the time, the condition goes away within a few months or years. 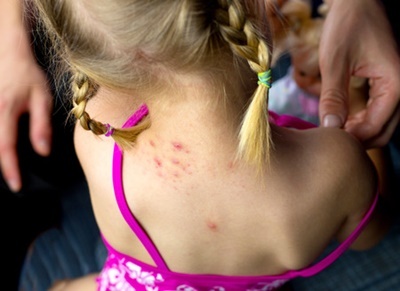 Other times, eczema can follow children into adulthood. Doctors do not currently understand why some children and adults get eczema but there are some clues. Genetics plays a role in the development of the condition. If your mom, dad, sister, or brother has eczema, you might get it too. Eczema is also associated with asthma and allergies. The condition is most common in cities and the northern part of the world. Certain elements are known to trigger eczema is some people. By avoiding these triggers, you can reduce your likelihood of developing an outbreak. Animal dander and saliva are common causes of eczema flare-ups. Other triggers may include specific types of soap, scratchy clothing, fruit juices, sweating a lot, dust, household cleaning products, or the development of a cold, cough, or flu. It’s important to understand that eczema tends to occur in cycles. At times, your skin may feel normal. When flare-ups occur, your skin may feel itchy and a red rash may appear. More than half of all eczema patients report to using alternative medicine to treat their eczema. Acupuncture has been useful in decreasing stress and reducing the symptoms of eczema. As this skin condition is often a reflection of an internal imbalance, the imbalance may be successfully addressed through regular sessions of acupuncture. With a personalized treatment plan, most patients can see results in as little as four to six weeks after treatment, depending on the severity of the condition. Acupuncture is designed to treat eczema from the inside out and can provide other great benefits. Natural therapies can also be used to treat eczema. Various plants and natural substances can be ingested orally or used topically to soothe existing symptoms and prevent further problems from developing. For example, sunflower seed oil applied to the inflamed area topically has been shown to reduce itching and inflammation while improving the skin’s ability to maintain a strong and protective barrier. Coconut oil has also been shown to positively impact eczema as it offers antibacterial properties. Other essential oils that have been proven useful in treating eczema include tea tree oil, German chamomile oil, rosemary oil, and geranium oil. Your diet plays a crucial role in the appearance of your skin. You may have noticed that when you eat greasy foods, you tend to break out. The same concept applies to eczema flare-ups. Many people find that certain types of food trigger their outbreaks. Introduce healthy vitamins into your diet to reduce eczema symptoms. Vitamin D, in particular, has been found to help eczema as studies have shown that severe eczema is associated with low levels of vitamin D. In addition, vitamin B12 has been shown to have some improvements in eczema sufferers. For many people, the severity of eczema flare-ups lessens with maturity. Some people will outgrow the condition all together. However, learning what causes your flares is the best course of action to avoid uncomfortable symptoms. To learn more about natural treatments for eczema, contact a professional naturopathic doctor today at Vitalia Healthcare in Vancouver.